The Carmelites — Martin County Convent Foundation, Inc. The Carmelites, led by Anastasius Peters, attracted people to the community with an offer of cheap land, and Marienfeld experienced steady growth. By the end of 1883, there were approximately 35 to 45 families settled in the young town. Another two years later, at least 100 families called Marienfeld home. Anastasius Peters, who was in Dallas in November of 1885, held a public sale of town lots and told a local newspaper that 60 German families and 40 American families were currently in Marienfeld. The Carmelites kept a steady schedule of construction during the community’s formative years. Soon after arrival, the Carmelites began constructing a small wood frame monastery and church, which they dedicated to the Most Pure Heart of Mary (“Purissima Cordis Mariae” in Latin) and St. Joseph. At the time, “this was the only parish church between Ft. Worth and El Paso.” While these buildings were under construction, a small tent church was used for ministry and meetings. The friars began constructing a permanent adobe monastery, measuring 84 feet long by 28 feet wide by 19 feet high, in 1884 The monastery was initiated as a “formed house with canonical standing in the Order in April, 1885, and is the only structure left standing on the site today. The year after, the settlers constructed a large permanent adobe church next to the monastery after wind storms damaged the original wood frame church in June, 1884. The settlers began construction on the adobe church in February of 1885 and built around the old church’s structure, incorporating the old timber into the building and veneering the outside with red brick left over from construction of the county courthouse. From 1885 to 1889, the area experienced an intense drought and subsequent sandstorms that destroyed many farms. “Many of the original families who established the town abandoned the area” and moved to Big Spring to work for the railroad. These hardships led directly to the Carmelites eventual departure from Stanton, as the original settlers who left were predominantly Catholic. Due to an increased population of Protestants, the residents of the town officially decided to change the name of the town from Marienfeld to Stanton in 1890. By 1890, the monastery had grown in importance to Texas and surrounding states, yet with this success came further initiative to spread their faith to other communities. The Martin County monastery served as the headquarters for three other monasteries in Louisiana and West Texas, which were organized juridically within the Carmelite Order as a commissariate, or vice-province, known as the Commissariate of the South. Most of the friars were German, with two from the Netherlands and one from Poland. Many of these were recruited directly from Europe to live and minister in the four monasteries. The Carmelites ministered from Stanton to farming communities along a 200 mile stretch of the Texas and Pacific Railway, in towns like Colorado City, Pecos City, and Toyah, as well as throughout West Texas and southeast New Mexico. This made their lives even more difficult, as the vast distances often meant they were away for weeks at a time. It is estimated that, by 1895, the Carmelites reached 5,000 people at 35 mission stations, traveling by train and buggy to reach the German, Scotch-Irish, Swiss and Mexican residents. Each Carmelite friar completed training in Stanton before traveling to one of the three sister monasteries to serve the community and surrounding parishes and missions. The friars were redistributed within the commissariate depending on each community’s needs. Novices could make a profession of simple vows of poverty, chastity, and obedience after one full year in the Order. After at least three years in the Order, a friar could make solemn vows of poverty, chastity, and obedience and become a full member. He would then have to complete theological studies before becoming ordained as a priest. 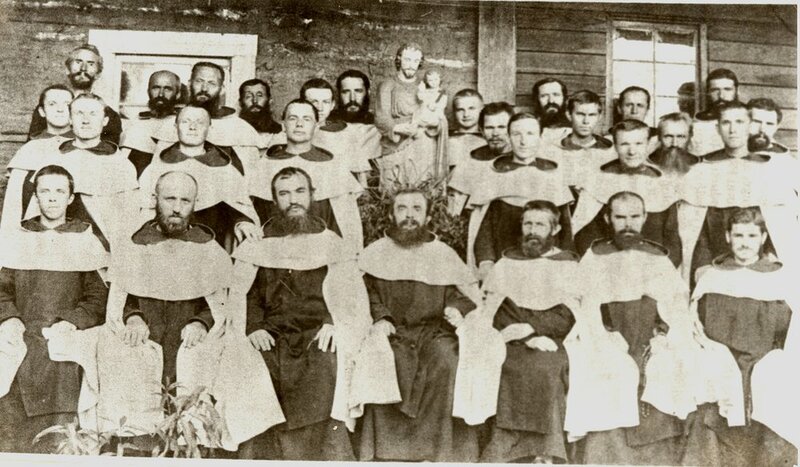 In 1889, the monastery in Stanton had a total of 35 friars in Stanton when just four years earlier there had been nine. The number of friars residing in Stanton declined sharply after 1890; the number stayed between four and eight from 1891 to 1900. Due to internal strife and mismanagement of the Commissariat of the South, the mission in Stanton was terminated in the summer of 1897. Many of the Carmelites moved to Louisiana to found a new monastery. The Sisters of Mercy purchased the monastery and surrounding compound that year and used it as their living quarters and chapel. They would stay in Stanton to run a nunnery and school for over four decades. The Carmelite Friars in front of the Monastery in 1885.